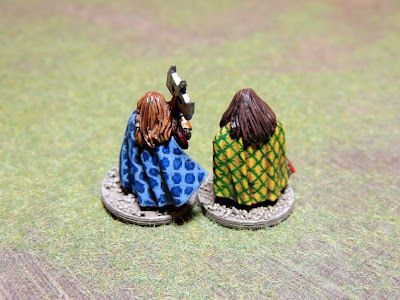 Finaly, here they are, contemplating the empty horizon of their endless fate, the last of their kind, kings of fading realms and lost dreams... Or, to put it straight, the last two figures I'll be painting for the SAGA dwarves project. 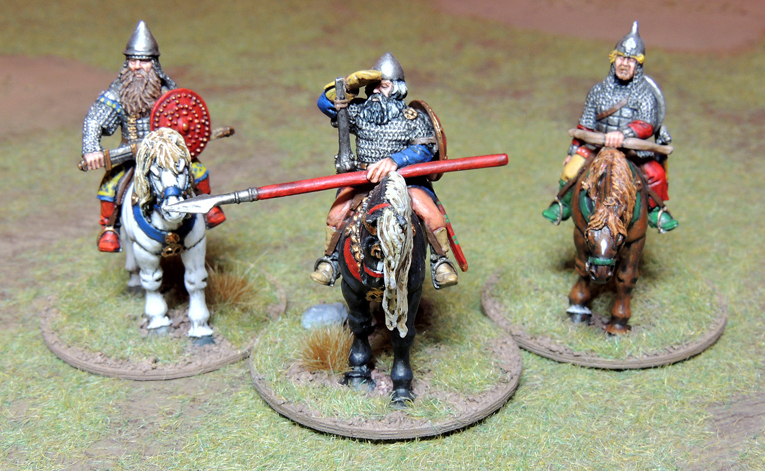 One of those could have make a convincing a warlord, but I did not really need an other one, instead of what I thought it would be fun to have my 6 pts war band led by the Anglo-Danes King Harald and his two brothers, from the rule book. Thus, since I wanted to have these two Dwarf Kings painted since ages, here are the two brothers. ...I have the feeling someone is staring at us from behind." Now, I know that I will suffer from the comparison, but I thought it would be fare to show the picture that inspired me for those last two. 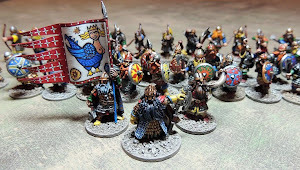 Again, it is a magnificent piece of art from the russian illustrator Ivan I. Bilibine, whose work led almost all my choice with the painting of the dwarf war band. I discovered the artist six years ago and his rather colorful prints have been haunting me ever since. Eventually it had me dive into the russian folklore and discover wonders that I never could quite imagine before. Lets just say for now that my attempt to render something from these corpus of inspiration is a first try, that is to be followed by many other. 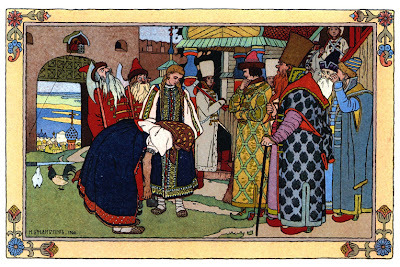 Ivan I. Bilibine, an illustration for the tale Vassilissa the Beauty. But, for the time being, I'll be soon setting sail towards other interests, other kind of being too. The kind of regular human sized figures of an appearance totally compatible with SAGA. But that will be for 2013, for I recklessly enrolled in a painting contest that I have absolutly no chance to win (well, I did it more out of friendship, than for the vanity of honors), whose rules stipulate that brushes have to be kept dry from paint until december the 20th. So, more on that latter, I'll probably post an entry detailing what my modest participation to this challenge will consist of. Oh, and I soon as I can take descent pictures of the all war band, I think I'll bundle it together on a single page... That is it for now! Your dwarves for SAGA have been fantastic. 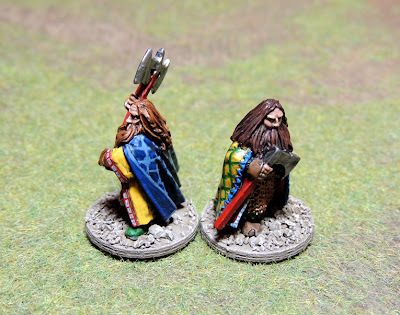 I took a much simpler approach to these fine fellows for LotR gaming, but I'd love to paint up some Rus for SAGA. I'll eventually come to paint some actual Rus two. I only wish there would be more appealing figures than the Gripping Beasts I have seen so far. You hit it right on the head. For me period interest might be the first step, but it all really starts with a great range of miniatures to truly inspire a new project. Like you, I've been waiting to find something a little better than what GB (and others) have to offer for the Rus. Same goes for Eastern European Renaissance. Vraiment excellent Nicolas. Les motifs sont superbes. Bonne chance aussi pour le concours. Wow! Those are lovely. Great painting and details all around. Thanks for the Bilibine tip. Wonderful stuff, and I'm going to have to follow up on them. 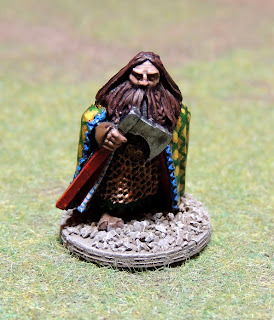 I've been thinking about how to do a fantasy project using the LotR Rohan figures, and this gives me some great ideas. Ces figures derniers sont superbes! Je suis impatient de voir le clans complète. Merci John! j'ai une bonne nouvelle, on va jouer notre prochaine partie de SAGA en français! D'accord. Il devrait être amusant pour toi. Tu auras besoin de patience. Really love the cloaks, some great brush work! 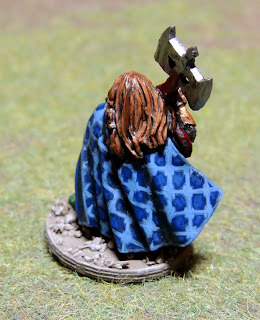 la peinture des capes est fantastique! Thank you Scott. 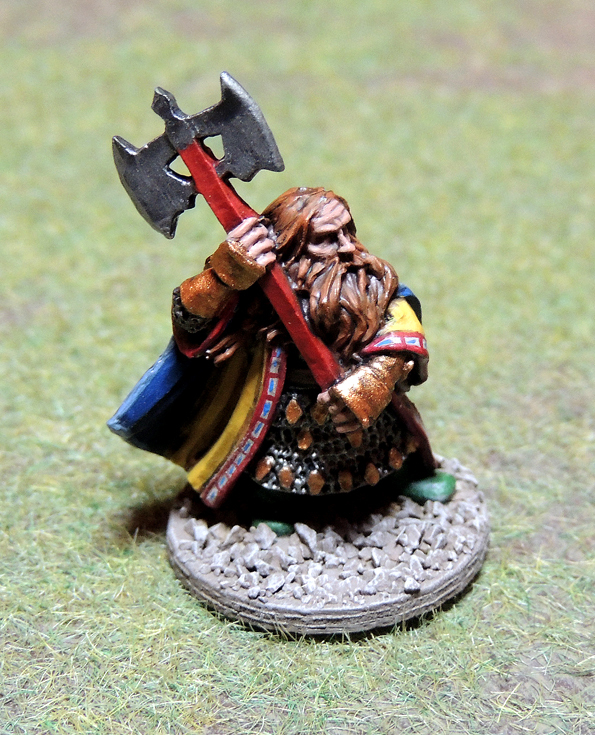 I hope to see some dwarves from the Hobbit soon. Thank you very much, I will try this technique! Fabulous work on these, Nicholas! 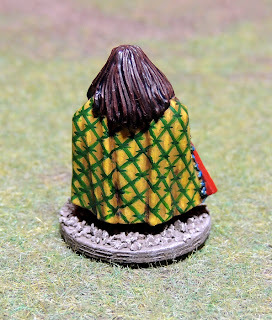 Been said already by others, but once agin, fabulous work on the capes. Wonderful figures, full so steely determination. Thank you and welcome to nowhere!